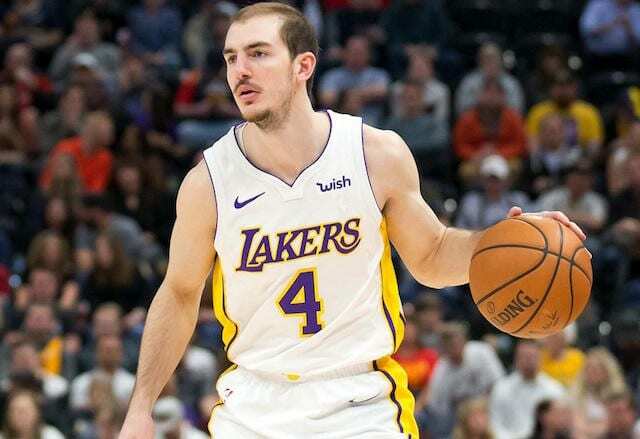 Being extremely passionate about something can make anyone do just about anything to get it, for Los Angeles Lakers’ shooting guard, Alex Caruso, his love for the game of basketball led him to serve as a ball boy for the Aggies long before he even attended the school. At the end of his collegiate career with the Aggies, he was named the school’s all-time leader in both assists and steals. Caruso’s journey with the Aggies didn’t start during his college days, he actually attended A&M Consolidated High School, where he played high school basketball and was named the district MVP. He joined the Philadelphia 76ers for the NBA Summer League in 2016 after going undrafted that season. Learn more about Alex Caruso below. Alex was born in College Station, Texas on the 28th of February 1994. He attended A&M Consolidated High School where he kicked off his basketball career under two amazing high school coaches Rick German and Rusty Segler. During his senior year, he hit an average of eighteen points and nine rebounds. At the end of his high school career, he didn’t just earn the honour as a district MVP after leading his team to the postseason, he was also named the TABC All-Star, as well as the TABC All-Regional, All-State. After high school, Alex Caruso served as a ball boy for the Aggies long before he even attended Texas A&M University. In his 4-year college career with the Texas A&M Aggies, he played a total of one hundred and thirty-seven games with a statistical record of 4.7 assists, 2.02 steals and 8.0 points per game. At the end of his collegiate career, he was named the school’s all-time leader in both assists and steals and also earned second-team All-SEC honours as well as the SEC All-Defensive Team honours. He majored in sports management at Texas A&M. After his college career, Alex entered for the 2016 NBA Draft but went undrafted. He would later join the Philadelphia 76ers for their NBA Summer League. In September of the same year, he signed a deal with the Oklahoma City Thunder, which would later waive him the next month. In November, the Oklahoma City Blue of the NBA Development League acquired him. The following year (2017), he attended another NBA Summer League, this time, with the Los Angeles Lakers. It was indeed a successful outing for Alex Caruso, in one of the games, he filled in for injured Lonzo Ball and led the Lakers to a win. After the impressive performance, the Lakers signed him to a two-way contract and he became the first player to ever go from the G-League (formerly League) straight to the NBA through a two-way contract. That year, Alex was very instrumental to the Lakers winning the NBA Summer League Championship which held in Las Vegas. His first NBA appearance was in October 2017 in a game against Los Angeles Clippers, despite playing for just 12 minutes, he recorded two assists, one rebound and two points. After another successful NBA Summer League outing in 2018, he signed another two-way contract with the team. 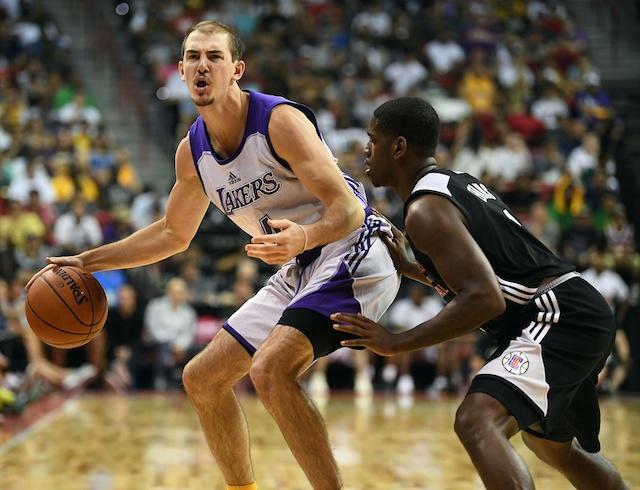 Alex Caruso is one of the three children born to his parents, Mike and Jackie Caruso. He has 2 sisters (Megan and Emily) who are both Texas A&M graduates. Megan graduated with the class of 2014 and Emily with the class of 2018. His father Mike Caruso also played college basketball at Creighton University. He currently serves as Texas A&M’s associate athletics director of game operations. According to the senior Caruso, Alex had options when it came to choosing a future career but the younger had always loved basketball, thus, he decided to make a career out of it. The shooting guard is a combination of size, height, skills and intelligence. He stands at a height of 6’4″ (1.96m) and weighs 84kg (185 lbs). He is strong and well built and these sure contribute to his success on the basketball court. Caruso is not married and has not been romantically linked to anybody yet, so, he is possibly single at the moment. His estimated base salary as at 2018 is $75, 000. Two-way-contracts usually come with a base salary of $75K which could increase to even up to $250K should the player spend the maximum amount of days with the parent club.